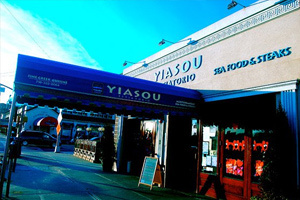 To walk into Yiasou is to be transported thousands of miles from Sheepshead Bay to the stores of the Aegean Sea. The elegant eatery, right on the Emmons Avenue waterfront, beckons hungry diners with the promise of freshly grilled fish, steaks and chops, as well as bevy of mouth-watering Greek specialties - all served up in an idyllic setting that is relaxed yet refined. Every course on the menu tempts with alate-pleasers. "Everything is cooked to order," said Peter Katsichtis, who opened this gleaming estiatorio five years ago with sons Michael and George. "Only in Manhattan can you find someplace that serves what we serve here in terms of freshness and quality," stressed Katsichtis. 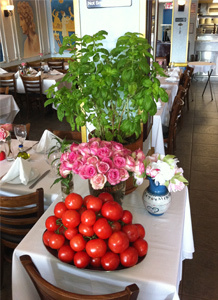 Specialties include simple, yet spectacular seafood preparations - whole fish such as branzino and pompano lusciously flavored with lemon and extra virgin olive oil, as well as lobster, Alaskan crab legs and langoustines, Shrimp Scampi rich with garlic and wine, and Filet of Sole on a bed of spinach and mushrooms. The mean menu is equally appealing, including such shows topper presentations as Rack of Lamb for two, as well as grilled veal chops, grilled lamb chops and hearty sirloin steaks, brought to the table by the welcoming and attentive wait staff. Appetizers range from the savory purees for which Greek cuisine is known such as Taramosalata, a rich spread made with caviar, and Skordalia, a fragrant spread combining garlic and potatoes, to grilled octopus, stuffed grape leaves and buttery Spanakopita, spinach pie encased in crisp filo dough. And, of course, there's Saganaki, the famous flambeed cheese appetizer, which is one of Yiasou's signature dishes, and creamy Avgolemono, a classic Greek soup studded with chicken and orzo, and enriched with egg and lemon. 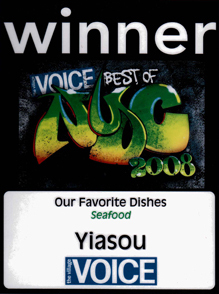 Yiasou [2003 Emmons Ave. in Sheepshead Bay (718) 332 - 6064]. Open Sunday through Thursday, 12-11pm; and on Friday and Saturday, 12pm - midnight. This week, Our Man Sietsema is happy to find Yiasou, a Greek spot in Sheepshead Bay. Yiasou offers all sorts of sea creatures that you can choose from, but it does it at about half the price. Anything labeled "skordalia" is totally dope: This mash of potatoes with olive oil, lemon juice, and raw garlic will set your mouth on fire. You can get it plain ($5.50), heaped up in a craggy Olympus surrounded by triangles of toasted pita. Even better is pantzaria ($7), an equivalent quantity of skordalia hemmed in with lightly pickled beets (which offers the added advantage of turning your urine bright red a few hours later). 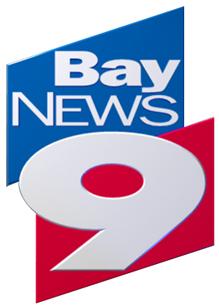 TMI! Moving on. The only items here that Our Man really likes is the octopus appetizer, and he doesn't mind the Italian-influenced dishes that sneak on the menu, like Sicilian-style baked clams. But really, it's the fish that he's after. Insist that the old man accompany you to the iced display and show you his stuff....The branzino ($20 per pound, one pound average) is the best deal of all, black-striped from the grill, with gobbets of smoky flesh easily pulling away from the largish bones...Gleaming blue and silver, these beautiful sardines were big and sweet-fleshed. And cheap, too: At $20 for eight (representing one pound), they easily satisfied our crew of four. 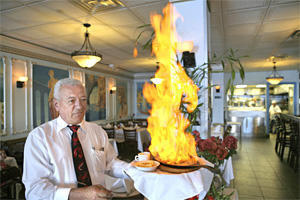 Yiasou restaurant welcomes diners with fresh seafood, sumptuous steaks and chops. 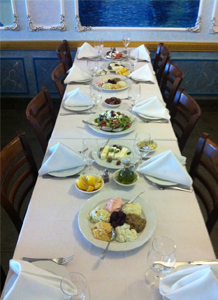 To walk into Yiasou is to be transported thousands of miles from Sheepshead Bay to the shores of the Aegean Sea. The elegant eatery, right on the Emmons Avenue waterfront, beckons hungry diners with the promise of freshly grilled fish, steaks and chops, as well as a bevy of mouth-watering Greek specialties — all served up in an idyllic setting that is relaxed yet refined. Every course on the menu tempts with palate-pleasers. “Only in Manhattan can you find someplace that serves what we serve here in terms of freshness and quality,” stressed Katsichtis. 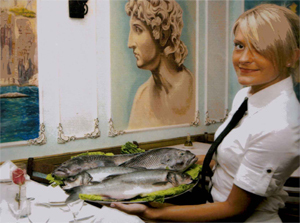 Specialties include simple, yet spectacular seafood preparations — whole fish such as branzino and pompano lusciously flavored with lemon and extra virgin olive oil, as well as lobster, Alaskan crab legs and langoustines, Shrimp Scampi rich with garlic and wine, and Filet of Sole on a bed of spinach and mushrooms. The meat menu is equally appealing, including such show-stopper presentations as Rack of Lamb for two, as well as grilled veal chops, grilled lamb chops and hearty sirloin steaks, brought to the table by the welcoming and attentive wait staff. Appetizers range from the savory purées for which Greek cuisine is known such as Taramosalata, a rich spread made with caviar, and Skordalia, a fragrant spread combining garlic and potatoes, to grilled octopus, stuffed grape leaves and buttery Spanakopita, spinach pie encased in crisp filo dough. And, of course, there’s Saganaki, the famous flambéed cheese appetizer, which is one of Yiasou’s signature dishes, and creamy Avgolemono, a classic Greek soup studded with chicken and orzo, and enriched with egg and lemon. Yiasou [2003 Emmons Ave. in Sheepshead Bay (718) 332-6064]. Open Sunday through Thursday, 12-11 pm; and on Friday and Saturday, 12 pm-midnight. Yiasou - "Easier on the Paycheck"
The salt breezes that blow off Sheepshead Bay and into the open front of Yiasou ("Cheers") make it an incredibly pleasant place to dine. The evening crowd constitutes a cross-section of Brooklyn: racially mixed, lively, and dressed to the nines, with lavish displays of bling and bosom. These customers find common cause in their mutual search for the perfect fish. Yiasou flaunts seafood of unspeakable freshness and is much easier on the paycheck, demanding about half of what you'd expect to pay in Manhattan. As my crew and I gazed out on the bay at sunset on a Saturday evening, the party boats came in to dock, disgorging happy fishermen carrying strings of bluefish and flounder. We regaled ourselves with the appetizers as we waited for our fish. Anything labeled "skordalia" is totally dope: This mash of potatoes with olive oil, lemon juice, and raw garlic will set your mouth on fire. You can get it plain ($5.50), heaped up in a craggy Olympus surrounded by triangles of toasted pita. Even better is pantzaria ($7), an equivalent quantity of skordalia hemmed in with lightly pickled beets (which offers the added advantage of turning your urine bright red a few hours later). 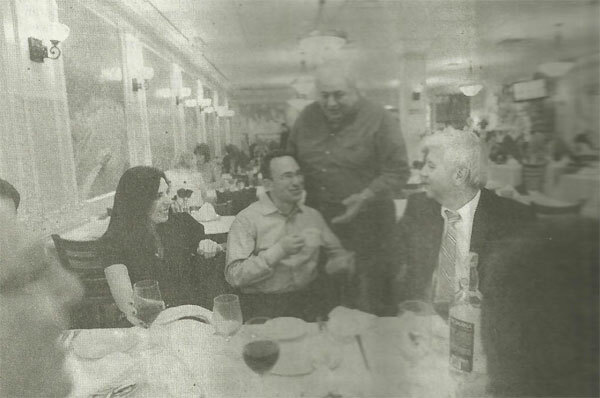 Since this is Sheepshead Bay, after all—the menu can't help but be pleasantly contaminated by Italian recipes, in addition to the questionable use of balsamic vinegar. The Coney Island fave of raw clams ($7.50 for six) is worth experiencing, but preferable are the Sicilian-style baked clams ($8.50 for six). There's also a raw-oyster service, seafood linguine, lobster bisque, and shrimp cocktail, all of which make good starters even though they don't belong in the Greek culinary canon. But whole fish with the head, skin, and tail intact is the reason you're here. Insist that the old man accompany you to the iced display and show you his stuff. While the menu lists over a dozen types of fish, only half are usually available. The branzino ($20 per pound, one pound average) is the best deal of all, black-striped from the grill, with gobbets of smoky flesh easily pulling away from the largish bones. The flounder ($25 flat) is more delicate, and must be crumbed and sautéed rather than grilled. Often there's red snapper, royal dorados, or sea bass, too, but one evening we found something on ice that wasn't on the menu. Gleaming blue and silver, these beautiful sardines were big and sweet-fleshed. And cheap, too: At $20 for eight (representing one pound), they easily satisfied our crew of four. 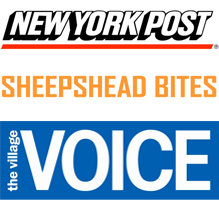 The venerable Village Voice food critic Robert Sietsema has again turned his gaze to Sheepshead Bay's waterfront, praising its rich seafood options and calling seafood restaurants among the city's best. 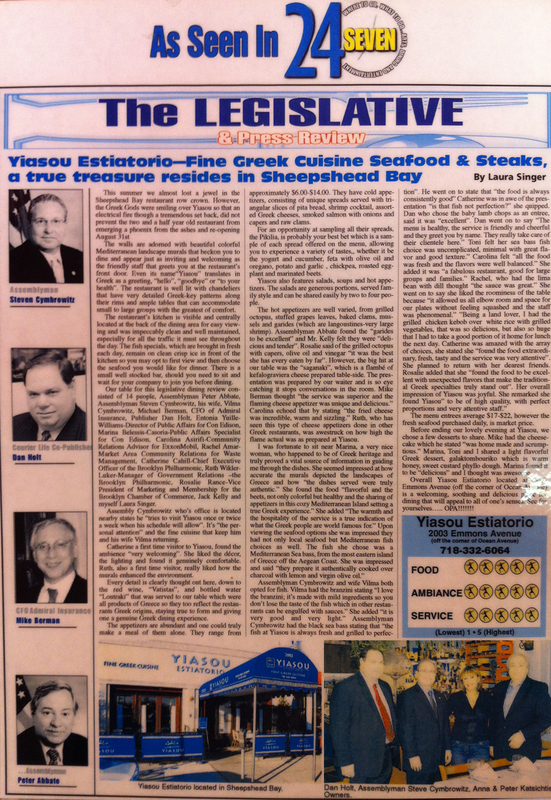 The list of "10 Best Bargain Seafood Restaurants" ranks Yiasou Estiatorio (2003 Emmons Avenue). And it's a damn good showing for the neighborhood, considering that of all 10 restaurants, only three were in Brooklyn – proving that Sheepshead Bay deserves its place as one of the city's best foodie destinations. 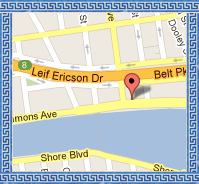 Hey, this is Sheepshead Bay, so this Greek place also makes Italian baked clams. And are they ever good, better than Randazzo's just down the bay. Don't miss soft but ropey charred octopus tentacles dotted with capers in a red-wine vinaigrette. Sold by the pound, your charcoal-grilled selections run to branzino, royal dorado, sea bass, and red snapper, while an excellent whole fried flounder holds down the bottom end of the fish menu, pricewise.